This is an installment to last week’s Perfect Switching article. Again, let me warn you that this page assumes you know a little bit of electrical wiring and reading basic schematic diagrams. If you don’t know what “parallel” or “series” wiring means, this page will provide you with some basics: http://www.1728.com/guitar.htm. Our goal is to devise a way to optimally utilize the 3 pickup configuration in order to have the widest sonic range possible. The basic Fender Strat switching gives you 5 possibilities. Brian May’s Red Special offers 7 possibilities (not including phase switching). The Strat pickups are wired in parallel, while the Red Special pickups are connected in series. The total inductance when wired in series is 30mH: (10mH + 10mH + 10mH). 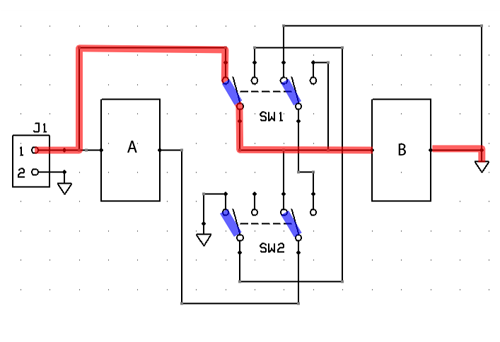 With series wiring, the resonant frequency is shifted down while the power is increased. The schematics presented in these pages are 100% original and has been prototyped and fully tested. You are free to copy the ideas presented here subject to the MIT license. There’s really no on or off settings here. All switch settings will produce an output. 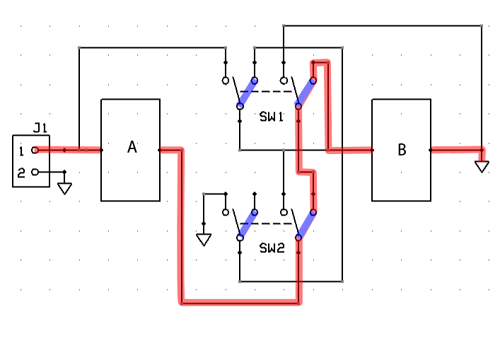 Instead of on-or-off, let’s think in Boolean: 0 or 1. 0 (zero) means that the switch is in its “left” position and 1 (one) means that the switch is in its “right” position. There are different ways to achieve the same set of combinations. 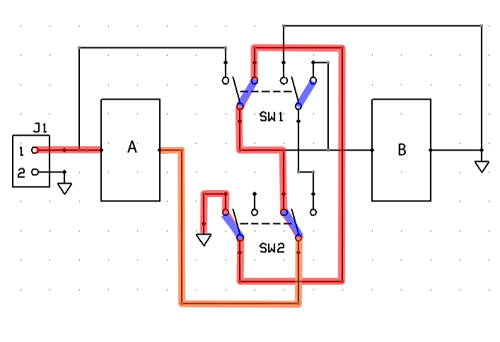 A previous version of this article employed a simpler wiring scheme. 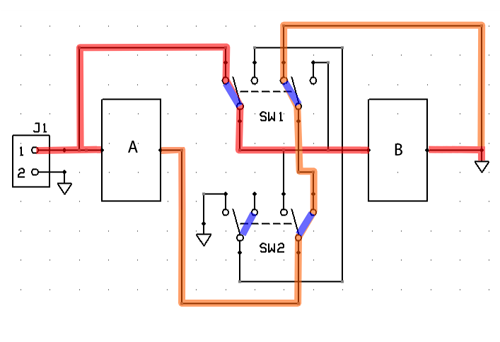 What’s unique about this updated schematic is that you have one switch (SW2) to control the choice of using one pickup (A or B) or two pickups (A and B). SW1 chooses between A or B when SW2 is in the one-pickup setting. 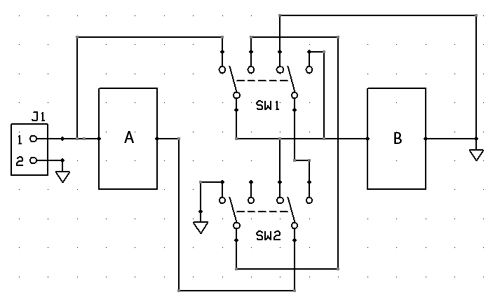 The same switch (SW1) doubles as the series-parallel switch when SW2 is in the two-pickup setting. The following illustrations show the signal flow for each of the 4 switch settings. Here’s the switching table. Note that we’ve introduced a new “don’t care” symbol: ‘x’. Where there’s an ‘x’, the switch’s position does not matter. Ok, well, there you go. We now have a whole set of pickup combinations to choose from. With 4 switches, we are able to choose from all possible series/parallel pickup combinations. And we haven’t even added phase-switching yet, which, as mentioned in the first part of this article series, gives you a thin, squawky sound that is only occasionally useful. Would these not be distinct from A|(B+C) and A+(B|C)? Thus, you cannot have the 4 combinations you mentioned. It is not possible to combine A and B nor A and C as a group. I’ll update the blog and make that correction. Thanks for noting.